As a nationally recognized wine authority and the wine editor for the San Francisco Chronicle, Bonne certainly knows his wine. But it is his historical narratives and personal anecdotes that caught my imagination right away and seduced me into reading far longer than I had planned to–it’s finals, and I have huge piles of research papers to grade. But when I came down with that bug that’s going around, I had a chance to spend a little more time with his book to discover that he offers a seriously comprehensive overview–over 600 wines from long time producers and favorites like Ridge and Ojai Vineyards to the positively youthful Donkey and Goat from the Brandts, and from larger vintners that you can find in a grocery store to tiny ones like William Allen’s Two Shepherds– to guide readers in understanding what’s going on today in California viticulture. While the book is visually appealing with plentiful photographs by Erik Castro, it is Bonne’s writing that kept me from putting the book down. Bonne is a gifted story-teller who gets at the heart of the stories he’s telling about the wines of California, and the people who make them, specifically, those innovative producers who are recreating winemaking through their quest to express the uniqueness of California terroir. Granted, I haven’t yet finished Jon Bonné’s The New California Wine. And yes, the publisher did send it to me in consideration of a review. 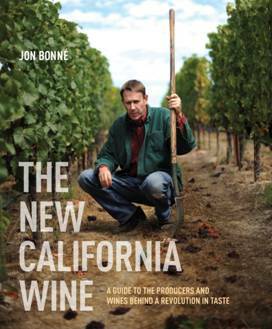 But here’s the truth–Jon Bonné’s The New California Wine is not a book I will ever truly finish. It will be read and referred to and reread. In fact, I see myself referring to this book and citing it as I go about my wine blogging business. In fact, The New California Wine is going on my bedside with my favorite books of poetry, philosophy, and depth psychology. Released in early November 2013 just in time for holiday gift giving (and it is a beautiful gift book well designed and with plentiful maps and mouth-watering images), The New California Wine was named one of Food & Wine Magazine’s top 10 gift picks, and was on Saveur’s list of the best books of 2013 . Bonne’s previous work in food and wine journalism earned awards from the Association of Food Journalists and the James Beard Foundation. Recently he’s been on tour in SF and NYC; Sunday December 15, 2013 from 2-5pm he’ll be in Los Angeles at Domaine LA located at 6801 Melrose LA CA 90038 where they will pour wines featured in his book and where you can get your own signed copy of it for $35. And if I could make it to LA, I’d definitely stay for dinner! In January, Bonne will hit the road again. Check his schedule here to see if he will be in your neck of the woods. Jon Bonné of the San Francisco Chronicle will be in the house, and we couldn’t be more excited! We’ll be pouring wines featured in his recently released book “The New California Wine” and the man himself will be here to sign copies and chat all things California grape-related. I think I’ll put it on my Christmas list. Definitely! You’ll find it to be a great read and a valuable resource for your wine blogging, Alisa . Oh and great prep for this year’s WBC in Santa Barbara! Watch for him to book a reading in your neck of the woods this spring.